60 years, yes it’s been 60 years since “that” midnight seasoned with aspirations of a million people. India and Indians have come a long way; gone are the days when India was totally depended on the western world for all that’s “cutting-edge”. Today, India is a proud member of the science & technology high table. Heat ghee in a wide bottomed pan. Add Sooji, and fry on low, till it gives a very nice aroma. Meanwhile keep water for boiling. Add boiling water to sooji, while mixing well, to avoid lumps. Keep stirring on medium, till all the water has been absorbed. Add sugar and salt, and mix well. Stir till it forms halwa consistency. Divide the halwa into 3 portions. Mix orange color in one, and green in an other. Take a wide plate, and put the halwa mixed with green and even it. Then put the one without any color and even. Lastly put the orange one and flatten. I did not feel like serving as it is, becoz it resembled the national flag. Very appealing with different colors and tasty too!!! Dear Dear! What a sweet way to celebrate this great day. They look absolutely amazing. Happy Independence Day! Gorgeous! What a wonderful way to celebrate! what a lovely way to commemmorate the independence day’! Fantastic !!! See you for inpendenceday parade at my blog. Wow Cinnamon – they are so perfect, cute and neatly cut. Happy Independence to One all All!!! What a beautiful way of presenting the halwa! Happy I-Day to you too! WoW! isn’t that beautiful? I simply love it. Oh you totally rock! Happy Independence! hey, the halwa is very creative and cute looking. I am so carried away. very simple and awesome. Amazing looking halwa. What a lovely idea. 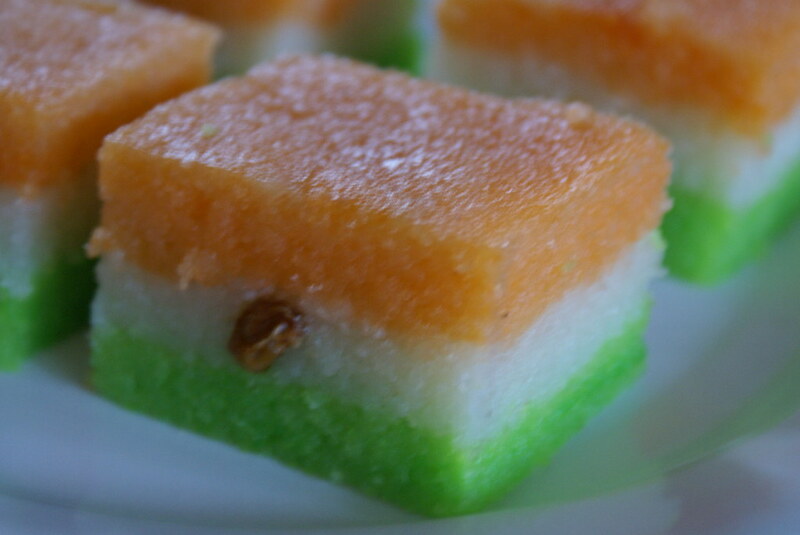 happy independence day to u too..
wow…tricolor halwa looks so delicious. Beutiful! Happy Indepence! Suji halwa is anever green sweet.You have taken pains to make it look so nice. Happy Independence day..those reminded me of lil flags we used to pin up on our uniform for the flad hoisting in our school…oh Boy I miss those days.. 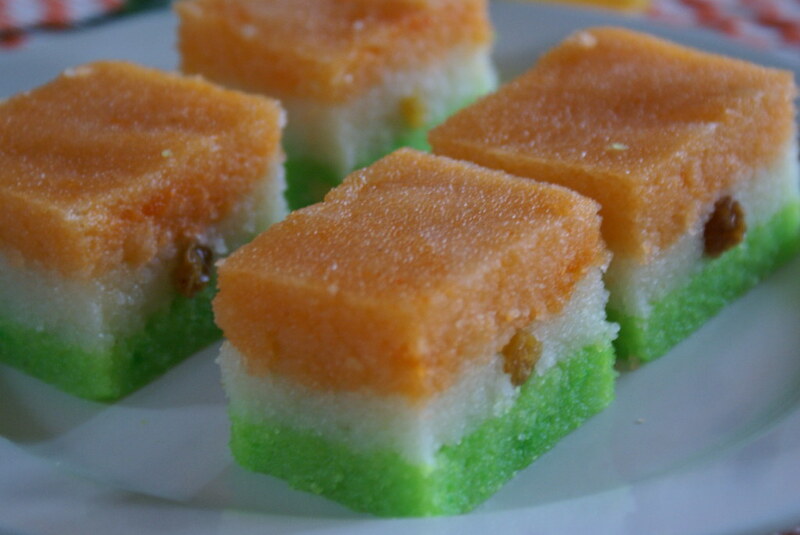 The halwa Indian flags are so lovely and I can understand about serving them …. OH MY GOD! Thats a picture perfect celebration! this is so out-of-this-world. i thot of making a tri-colored sandwich.. but got busy cooking for the events.. was a busy holiday for independence day this year 🙂 enjoyed it though.. This looks so great! What a wonderful independence day dessert. Really awesome. Excellent… words are not enough to describe their beauty. Great. I just have no words…so lovely and amazing. Perfect colouring. I liked your blog. It’s so nice and you have explained things wonderfully. I have bookmarked it and will be visiting regularly. If you get time, visit my blog as well. WOW!! So beautiful !!! And looks cute too….me too…I would not have touched it !! !